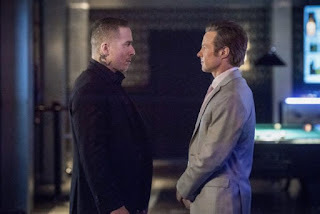 Last week on Arrow, Oliver got hopped up on Vertigo and went through an extreme hallucination where he came to the realization that he needed to “get back to basics,” meaning that he has to continue his mission of “saving the city” by himself, without the help of Team Arrow. He also got impeached because of his recent political activities. So now Oliver has a lot of free time to take his fight against Diaz on and save the city. He no longer has Team Arrow to work with, and Oliver also made the decision that he would do things going forward without Felicity operating as “Overwatch” either, disappointing his wife. 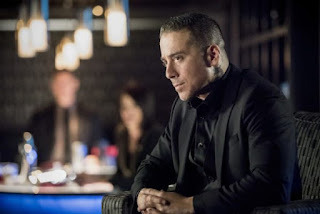 This week on Arrow, however, we take a detour from Oliver and his new solo mission to “save the city” and instead focus totally on bad guy Ricardo Diaz, AKA “The Dragon”, hence the title of the episode and even the into logo being different. 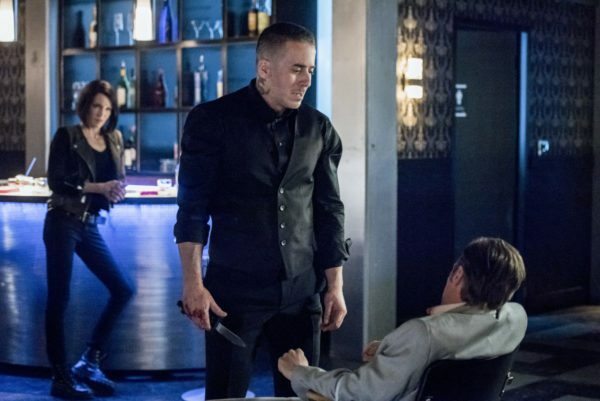 This episode is so villain-centric, that there’s only one scene with Oliver as we spend a lot of time with Diaz as he tries to negotiate yet another way to the top of the food chain in the criminal world. The flashbacks are back this week as well (something we haven’t seen in a while) as we go back more than 30 years to when Diaz was a young boy at an orphanage, showing that the man running a city-wide criminal empire had humble beginnings. He also wasn’t the big shot either, being bullied by another kid at the orphanage, who even burns up a photo of Diaz’s father, which serves to be the motivating factor of his life as shown later on in the episode. Fast forward to today, Diaz (with Laurel from Earth-2 as his muscle) takes a trip out of Star City to Blüdhaven (another city in the DC universe) to make a sales pitch to the criminal organization called “The Quadrant” as he wants a “seat at the table.” The Quadrant seems to be at the top of the food chain as they run thing across the country. Having taken over all aspects of Star City, Diaz’s ambitions are now growing and he wants them to help, but first, he has to convince them. Diaz and Laurel meet up with Eric, the son of one of the heads of The Quadrant for his sales pitch. The son, born of privilege, sees Diaz as “beneath” him and tells him in order to even get a meeting with his father, he has to do something for him. Turns out, The Quadrant has a snitch currently in government custody that they need to find out about so they can deal with him. Diaz decides to go forward and help them retrieve their former associate. Laurel rides him as she feels he’s being taken advantage of by The Quadrant. Diaz reassures her that he has everything under control. After Diaz locates the person in custody, he tells Eric where he is. They tell Diaz to retrieve them from custody. Diaz and Laurel storm the safehouse, murder all the federal agents (in an impressively choreographed gun-fu fight sequence) and capture The Quadrant’s guy, predictably, The Quadrant shows up and not only kills their former associate, they gun down Diaz as well. He’s no fool and was wearing bulletproof armor, suspecting a trap. Meanwhile, in Star City, Felicity is going crazy not knowing where Oliver his. She sees news reports of the Green Arrow dealing with bad guys in The Glades, but buildings are blowing up. With Oliver cutting off all communication with her, there’s no way she can know if he’s dead or not. Felicity meets up with Curtis. While their vigilante activities have ceased with each other after his group split from Team Arrow, they still have a company that the two run together, and they are trying to get back into each other’s good graces and continue working on their tech company. Having been betrayed, Laurel thinks she and Diaz should pack it up and head back to Star City. Diaz remains focused. She comments that he’s showing behavior similar to the guy who brought her over from Earth-2 (Hunter Zoloman/Zoom), with his extreme dedication that could lead to him destroying himself. Nevertheless, he continues. He storms the nightclub that Eric works out of and takes the young man hostage. He knows that after torturing Eric, he learns that The Quadrant was never going to give him a seat at the table and their plan was to kill him and take over his Star City operations. Diaz has other things in mind. Heading to The Quadrant’s headquarters, he delivers Eric to them, however, Eric had a bomb strapped to his body which explodes and kills many of The Quadrant’s foot soldiers. The remaining ones, Diaz and Laurel defeat while entering their headquarters. Like a video game, they make it in and deal with the big bosses, The Quadrant as they are sitting in a boardroom surrounded by trigger-happy goons. Eric’s father, disgusted with Diaz, says they have no open seats at the table, and will not do business with someone of Diaz’s quality. Diaz promptly shoots him dead, remarking that now there’s an open seat at the table. The other members of The Quadrant decide to entertain him and see what plans he has. Felicity realizes that she’s fearful of Oliver possibly dying since he now has no support. Just then, Oliver shows up at her home and reassures her that he will always come home to her. Oliver is almost Zen in his thought process. This could backfire because, like she said, there’s no guarantee. Diaz seems to have everything he’s been fighting for: a seat at the table, and his criminal empire expanding even more. However, he’s not satisfied. He has one thing he still needs to do. He tells Laurel of “The Dragon,” his one fear, the bully who told him that he was a loser and would not amount to anything in life. He feels he’s finally ready to conquer his fear as he and Laurel take a trip to the bully’s house. Naturally, the bully is now just a regular guy with a wife and kids who drives a truck. Diaz finally takes his revenge against the guy. After telling him that he burned his arm saving the picture of his dead father, and now it’s payback time. He douses the man in lighter fluid and proceeds to set him on fire. Laurel looks on in disgust, thinking that maybe she’s with a guy just as bad as Zoom. Next week, Oliver and Diaz face off.